We no longer sell THOR product but we still often recommend it. They make the best system for smoking cessation because they work with Ann Pennman (who runs the required IRB for that application). They also make the NovoThor® and the BrainThor® products that are very unique. Precision Emitters: Every Thor emitter is calibrated at the factory before shipment to ensure accuracy in the output. This means that when the protocol calls for delivering 4 joules at a depth of 2 inches over a 2 minute interval, the Thor emitter does exactly that. Thor laser systems even include annual recalibrations (for 5 years) to maintain that accuracy. Optimized Outputs: Unlike many other systems, Thor systems includes 3 emitters with 3 totally different properties. Thor emitters deliver the exact amount of energy required to hit the "sweet spot" of treatment by separating types of treatments into 3 groups, each with a dedicated emitter. They do not mix shallow-treatment LED emitters with deep-treatment lasers emitters. Unique Protocols Emphasizing Stimulation/Inhibition: Thor understands the dual nature of lasers. They can stimulate healing and they can inhibit pain. By treating different parts of the body with Stimulation (to heal the injury) AND Inhibition (to reduce pain), they produce the best result for any condition. Digital Protocol Library:Thor lasers include access to their free online library of protocols. Many of the protocols were created by installing an measuring device deep into the tissue and then treating the area with a master emitter. Once the optimum energy density is measured, a protocol is create that will allow any calibrated emitter to get the exact same results as the test subject. 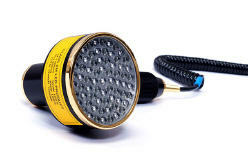 Heavy Duty Construction: Large metal connector, oversized wire and all metal emitter make the Thor Lasers one of the most heavy duty products on the market. No wonder they have the best warranty in the industry. Industry Leading Warranty: With a 5 year warranty, the Thor LLLT system is at the top of the industry. High Duty Cycle: Most manfucturers drop to 50% or less duty-cycle (on/off ratio) when pulsing. Thor system are set to 88% duty-cycle so they offer a higher delivered energy while pulsing compared to most other systems. Thor Laser systems (every system requires a controller and at least one emitter). 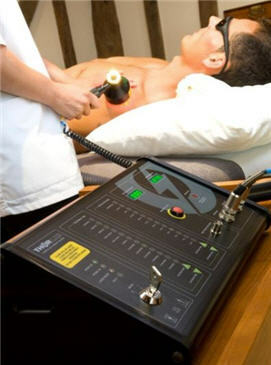 Thor Lasers use 3 different emitters, each specifically designed for a specific type of therapy. These are the prices when we were working with Thor. They might have increased since then. 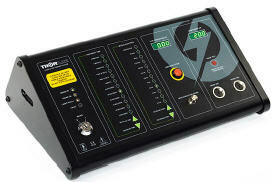 This unit can control has connections for 2 emitter and allows for setting time, power level and frequency. It works with all available emitters. 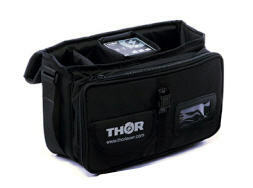 The Thor Portable Controller is designed for Veterinary practices. It works with all optional emitters. This high-power class 3B cold lasers emitter includes 5 diode emitter for maximum coverage and 1 watt of continuous output for maximum depth of penetration. This emitter has a focused pinpoint output for highly targeted treatments. This 660nm laser 30mW emitter includes a acupuncture tip. This product is used for smoking cessation and other trigger point therapies. Call us for more information about custom built systems. Using the Thor System of controller and emitters, they have developed some the industries most advanced protocols. Unlike other laser manufacturers, Thor believes that many problem have roots in the glandular system so their protocols include treating the main problem area but then they also include separate setups to help heal the glandular system. Thor is also unique in the fact that they really understand the dual nature of cold laser therapy. Cold lasers can be both stimulating (healing) and inhibiting ( reducing pain) based on the amount of energy that is put into each area. Using this philosophy, they have developed a system that allow them to maximizing healing while also helping with immediate issues like pain. Their protocols are optimize to help your patient recover and feel better faster. If you are searching for a flexible cold laser that will put your business on the cutting edge, the Thor family of cold lasers is the option for you. The therapy is usually performed by a doctor, therapist or technician and takes about 10 minutes. Most protocols recommend multiple therapies two or more times a week. LLLT has been used for many years on sports injuries, arthritic joints, neuropathic pain syndromes, back and neck pain. Over 200 randomized clinical trials have been published on LLLT showing the benefits of cold lasers, more than half of these studies have been on pain. Customers like the British and US military, Premier Division soccer teams, Olympic teams, Formula 1, rugby and cricket team therapists as well as specialist pain clinics in the UK and USA use Thor cold lasers to accelerate healing and help with pain control. There is such a thing as too much power. If the area being treated receives too much energy, the area will get an analgesic effect but it may not heal as quickly as if the optimum energy level is achieved. Every treatment is a balance between short-term benefits and long-term benefits. Every Thor LLLT system is built to order. 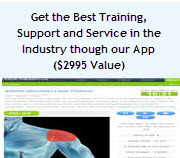 Contact us at 800-388-0850 to get more information about Thor low level laser therapy systems.